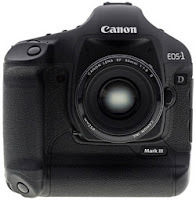 The big story with the Canon EOS 1D Mark III is that it's a better, more universally appealing professional camera for more types of professional photographers. I think a lot of intermediate photographers may want to make the jump as well, given its more friendly interface and astonishing high ISO performance. With past Canon EOS 1D announcements, the big story was the incredibly high capture speed at reasonably high resolutions. The amazing technology required to dump high res images at high speed tended to dominate our coverage of these sport-tuned professional SLRs. But the scene has changed. The additional 1.5 frames per second isn't the most important improvement with the Canon EOS 1D Mark III, it's just a nice enhancement. The same goes for the jump from 8 megapixels to 10. The Canon EOS 1D Mark III isn't just for sports anymore. It's a more universal camera for the vast majority of pro photographers. With the multiple improvements in the new camera, photographers will no longer need to trade off resolution, image quality, and speed against each other. The 1D Mark III now has enough of all three to satisfy a huge slice of the market in a single camera body.